Tripod are a three-piece rock band from New York that have replaced traditional instruments such as guitars and keyboards with intriguing alternatives like saxophones, clarinets, flutes, and a 12-string bass. I was immediately taken with the idea and could not wait to hear their first effort. Approaching the music with a space rock outlook, I was hoping for long, spontaneous jams, but this music is not meant to be taken as a Nik Turner-induced dreamy walkabout. 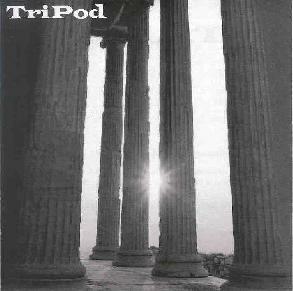 Tripod play structured rock with a variety of moods and tempos. Drums and vocals accompany the woodwind assault along with the 12-string bass which adds thickness to the atmosphere. All of the instruments are handled with startling precision. There's no mistake about the mood that any given song will strike. The first song, "Rain Parade," with its simple yet catchy chorus, defines the musical style as a mix of progressive and popular rock with tinges of psychedelic and jazz. The bombastic saxophone recalls the Peter Gunn theme popularized in the original "Blues Brothers" movie. "No Side of Maybe" is very much a pop-style song. The vocals are very accessible, perhaps too much so for the space rock fan. This is probably the main detraction of this CD, but not one that should stop you from checking this music out. The majority of playing time focuses on music that simply rocks. The saxophone solos are the true voice of this CD. They sing, shriek, cry, and laugh through a variety of emotions. "As the Sun" has to be my favorite track. The vocals are dark and brooding, as is the saxophone. "Danger Isn't Safe" is a truly progressive cut that comes closest to Hawkwind-style saxophone wildness. I would have preferred this as an instrumental track because the vocals often disturb the flow of the music even though they are well done. Tripod play for a wide audience, though, so I suspect the vocals may be well received by the majority of listeners including many space, psych, and prog rock fans. The musical artistry on this CD is well worth experiencing. You can sample a few of the tracks at their website before committing to a purchase. Contact via snail mail c/o Tripod; PO Box 230582; New York, NY 10023-0582.